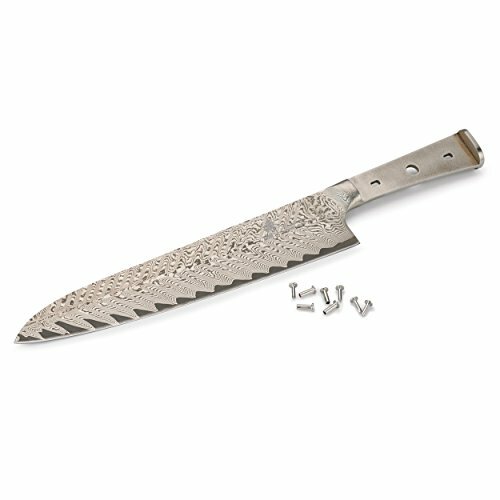 Make your own custom 9-1/2" ZHEN 101-Layer German Damascus Steel Chef's Knife with this blank. You can customize your knife by choosing from a variety of woods to make the handle yourself. A chef's knife is considered a cook's most valuable tool because of its versatility. It can be used for slicing, dicing, and much more. Now you can create your own - as a gift or for your own use. Each Zhen blade has its own unique pattern on its surface and an edge that remains extremely sharp over an extended period of time. Designed with the professional cook in mind, this knife makes a great gift for the cook in your family. Hone your blade with a steel or ceramic rod weekly to keep it sharp. We recommend sharpening your blade with a whetstone at an angle of 15° per side. Blade length is 9-1/2", with an overall length of 14-5/16". Knife blank comes with 4 sets of stainless steel rivets. Hand wash your blades with gentle dish soap, rinse clean and dry immediately. Handle material is sold separately. Mosaic pin stock sold separately. CAUTION: DO NOT chop bone or use this knife on a hard surface like a glass cutting board, tile, or granite. Blade length is 9-1/2", with an overall length of 14-5/16"